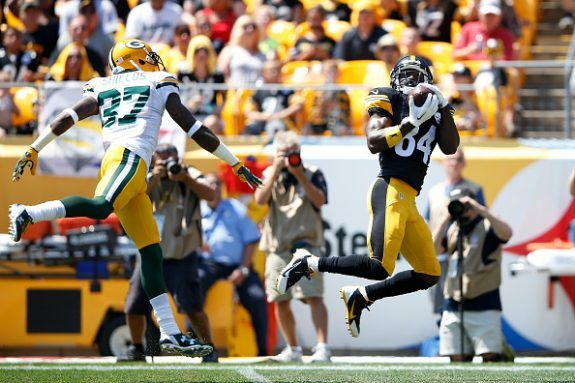 The Steelers finally were able to win a preseason game, their first of 2015, but paid a major price in the process. The team rallied from down 16-9 at halftime to earn the win with a pair of TD passes from third string QB Landry Jones, but before all that they lost All-Pro center Maurkice Pouncey for the second time in three seasons with a big injury. Pouncey left the game near the end of the first quarter with a broken bone just above his left ankle. Reports say he will have to have a surgery on the ankle, and it’s unknown just how much time he’ll miss. The team also lost defensive end Stephon Tuitt with a sprained left ankle. Backup QB Bruce Gradkowski left with a finger injury on his left hand. The big news is Pouncey, who two years ago was injured on the first drive of the season in a loss to the Titans when he tore his torn anterior cruciate ligament after David DeCastro fell into him on a run play. Cody Wallace will be the center while Pouncey is on the shelf. The seven-year vet has started six games for the Steelers since 2013. The Steelers were not the only ones that walked away with a big injury, as Packers WR Jordy Nelson tore his ACL, and he’s going to miss the entire season for Green Bay. 1 Comment on "Steelers Top Packers 24-19; Pouncey Breaks Ankle"
We got a win and thats nice but we paid a huge price in the process . More than likely , Pouncey is going to miss , at minimum , half the season . if not all of it . The Tuitt injury is probably a three or four week injury . As Dr. George stated , the 900 pound gorilla in the room was the Steelers defense and unfortunately that question got answered early . Aaron Rogers and the Packer offense moved the ball against the Steelers starting defense as if the Steelers were standing still . While the Steelers tightened up some on the James Harrison sack that led to a safety , it still was obvious the Steelers had no answers for the Packers offense . At the end of the day , we have more questions now , than we did coming into this game . Thats not a good sign of things to come .